Flex-darts are a new Benoil range, developed from the range of standard wiper darts. These allow wiping of large diameter tubing or pipe sizes, while still passing through restrictions. For example an operator may want a dart to wipe a 4� diameter pipe, but crucially they must pass a 2-7/8� restriction in the string and then �pop-out� to re-seal on the 4� diameter pipe. This flex-dart has a �� diameter threaded metal spine. This gives the dart rigidity where it is needed. Being a modular design, this allows as many or as few cup elements to be specified as required. The metal centre also allows the flex-dart to make a positive connection at the nose and or tail end. This allows the dart to be towed on a line, or to be fluid-driven like a conventional wiper dart. The tail connection allows the darts to be used as a mule (as in the picture above). 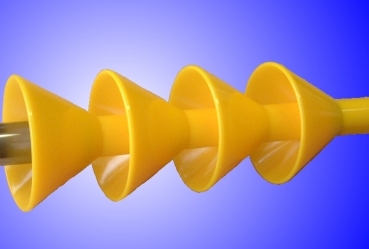 The nose connection can be used to trigger another application down-hole, similar in principle to drop-ball triggers. However the flex-dart can be pushed in horizontal or even �uphill� sections in break outs, much more positively than a drop ball, as well as being able to pass a restriction in the string. Benoil has made a few different pipe size versions of these flex-darts already. We can tailor the design to wipe both larger and smaller pipe sizes, and to pass different pipe restrictions. The flex-dart shown is 80A shore hardness � others, both softer and firmer grades are available. This flex-dart will withstand 150C down-hole for a few hours service. Versions of such darts can also be adapted with burst discs for cementing though tubing. If you want further details or wish discuss your particular requirements, then please contact us on the button below. This website was authored by the IT Manager, Benoil. All pages of this site are © 2019 Benoil Services Ltd.